Would you like to move your notes from the insecure company server to your own server? 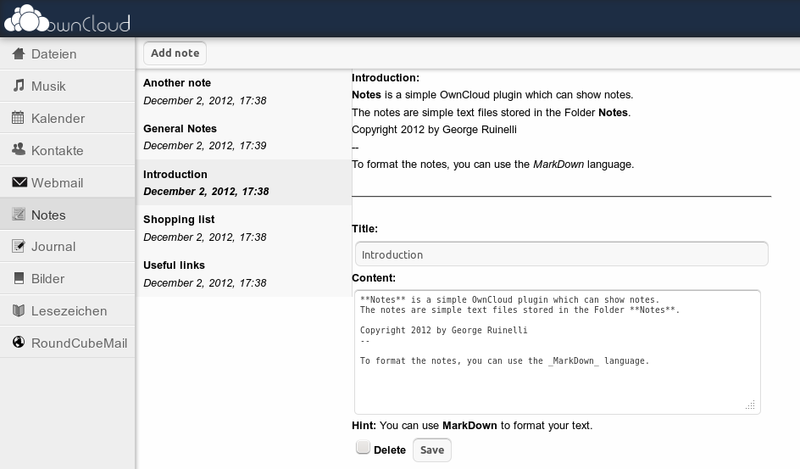 I wrote a simple app that helps you to manage notes inside your OwnCloud Webinterface. Will this app be updaten and develloped in the future? I no longer develop the notes app. But like you saw, there is a new one which is better and more up to date. 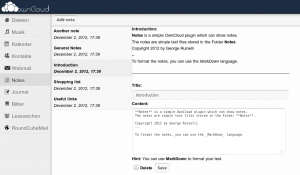 do you plan a migration to owncloud 5? Hi, is the source code of android application available? I would like to try integrate it in the official owncloud application. Thank you. I do not understand why you connect my Owncloud app with Android-Sourcecode. My app is written in PHP and integrated into Owncloud. This has nothing to do with any Android-Code.